This is a well made magic box! 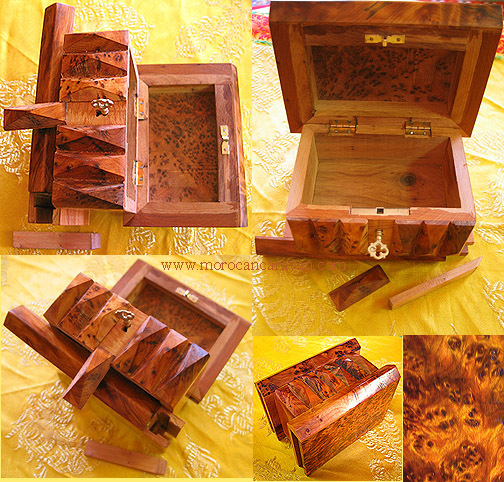 This beautiful rectangular, FUN puzzle box is handmade in Morocco from the rare thuya wood burl. Thuya is related to cedar and has a wonderful aroma and only found in Morocco. Add it to or start your unique collection! This makes a nice jewelry box and a perfect gift for family and or friends to play with! The trick is that the key is inside the box!! So you will have to use magic :) to get to the key to be able to open the box. Possible? Yes!! As a tip so that you don’t damage your box, there will be sliding only, no pulling and no twisting. Each word “slide” applies to a different part of the box. Slide, slide, get the key, then slide, slide, open the box and smell the aroma inside! What are you waiting for? Add it to cart and plan to have fun, also challenge family members and or friends! Also available for wholesale quantities. Please mail us if interested!